For the past few years, the candidates and youth of the Home of the Mother in Jacksonville, Florida, USA, accompanied by friends, have made walking pilgrimages during Lent and Advent to the Shrine of Our Lady of La Leche. 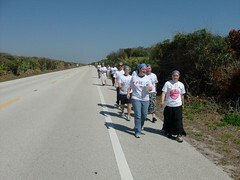 The pilgrimage makes its way from Ponte Vedra, Florida, to St. Augustine, Florida and is about 15 miles (24 km) long. 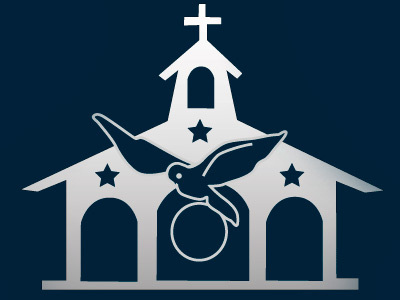 On Sunday, March 20, a group of Servant Priests and Brothers of the Home of the Mother (two priests and two brothers) and a lay member of the Home went to the Province of Leon to have a retreat for boys in Fabero and the surrounding towns. What's NEW on HM Kids website? "Love me and make me Loved" - This is the theme for HM Kids this lent. On the HM kids website, you'll find all you need to help you live this Lent well - from the Stations of the Cross, to some great ideas of sacrifices you can offer up to console the heart of Jesus this lent. 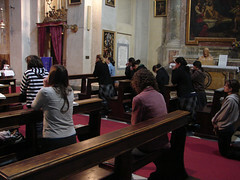 On Sunday, March 27, the Servant Sisters in Rome hosted a group of young women from college campuses here in Rome for a Lenten Retreat. Everything began with Exposition of the Blessed Sacrament at 10:00 am, immediately followed by the first meditation, which was on our vocation to holiness and the importance of our Baptism, along with the life of grace and our being children of God. This year we had our third camp in Ecuador. 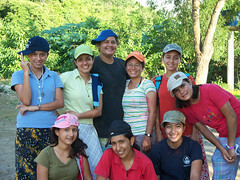 77 girls were able to participate, plus Eliana Palma and Dulce who were the leaders. In the days before the camp we situated out little tents, which we borrowed from some friends, in a farm not far from Chone. The site was small but welcoming. On the farm there was a small house and outside there were showers and bathrooms, but the best part about site was the river. 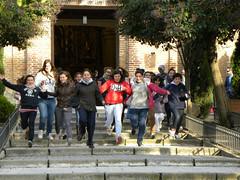 A tidal wave of graces has overtaken Alcalá de Guadaíra (Seville) and the community of Servant Sisters here. 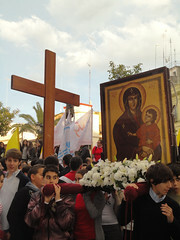 This past March 15, the WYD Cross visited this humble Land of Mary. Alcalá was blessed with this gift from Divine Providence. For 6 months now, here at the "Maria Inmaculada" School in Belmonte, we've been saving up and working hard to try and raise money to go to WYD this summer. We started thinking of ideas to raise money. What could we do? We can't work - we're underage minors and moreover, we're in the middle of an unemployment crisis. Raffles are all too common...But, we didn't give up. We knew we'd find a way. All of a sudden, a former student from our school came up with a great idea: making FELT PINS! They are now in style and easy to make! 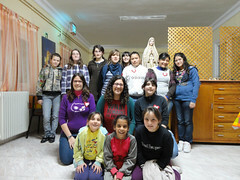 The community of Servant Sisters of the Home of the Mother in Mostoles (Madrid, Spain) hold weekend retreats for girls and families almost every month. March 5-6, we had a retreat with 22 girls and 6 Sisters. On Sunday, other girls who had not been able to come on Saturday, joined in.